The Foundation held its second Friendraiser of 2017 on Nov. 2 at JP Morgan Chase Tower. The centerpiece of the morning’s program was a panel discussion with three Youth Conservation Corps interns, Bria Foster, Luis Cabrales and Lance Williams, who shared their experiences and stories about working in the Preserves. Foundation President Shelley Davis moderated the panel. Serious and thoughtful and sometimes humorous, their responses gave attendees a close up look at a program in which the Foundations makes its largest investment year after year. Bria, 23, spoke passionately and animatedly about how she got started in conservation work, through a program called Fishin' Buddies when she was 7 years old. She did stints in the Student Conservation Association and Youth Outdoor ambassadors. “I’m still introducing myself to new things,” Bria said. “It’s been a great journey so far.” The Dillard University graduate is now back working part time in the Preserves with the goal of pursuing a full-time career in conservation. Luis spoke about his introduction to the preserves, through a field trip to Kickapoo Woods on Chicago’s South Side when he was in high school. That led him to apply for an internship to become a Corps crew member. The 19 year old is now a University of Illinois-Chicago sophomore majoring in biological sciences. More than 60 civic and business leaders attended the Friendraiser. Lance, who is currently working the Corps’ adult program, explained the purpose of Conservation Corps and how he became involved with it, starting with visits to Sand Ridge Nature Center while in he was in high school. That exposure led him to want to “learn more about nature topics,” he said. All three panelists expressed a desire to continue working in the conservation field and said they enjoy their families' support of their work. Luis, who got a job at the UIC greenhouse because of background in the Corps, also spends time volunteering, which he says has taught him a lot. But he knows he still has much to learn. It’s going to take a lot of hard work to be successful in this field,” he said. Board member Mark Lester, an executive with JPMorgan Chase & Co., hosted the breakfast gathering of business and civic leaders from around the Chicago area. 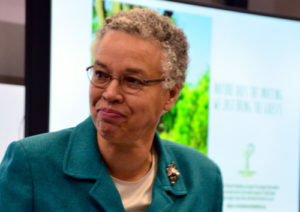 He led off the program by introducing other board members and acknowledging Cook County Board President Toni Preckwinkle, Commissioner Larry Suffredin and Nicole Elam, Vice President, Government Relations at JPMorgan Chase & Co. 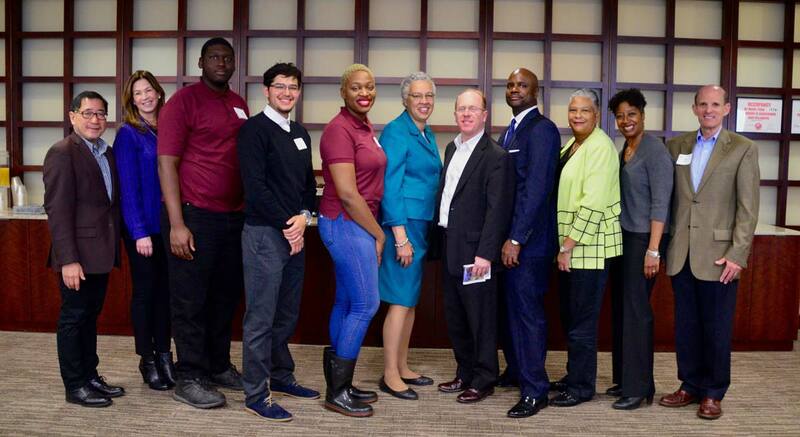 Following the panel discussion, President Preckwinkle followed by thanking Bria, Lance and Luis for speaking in front of “a roomful of strangers” and encouraged them to pursue their dreams by taking advantages of the many opportunities available throughout the Preserves.